Looks like a flood of new Freedom boards is coming out 🙂 : I have found out about this new one: The FRDM-KE02Z. A detailed review of the board features can be found on the element14 page. The element14 article details as well how to add support for it in CodeWarrior. 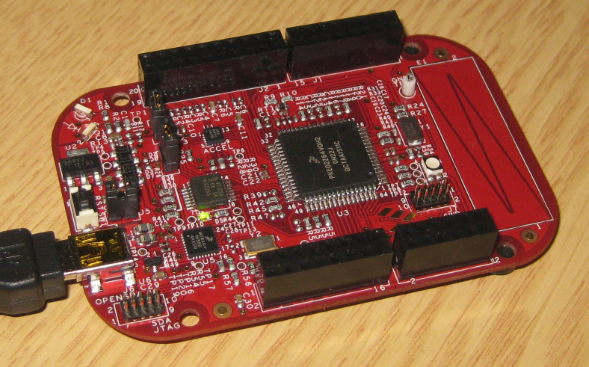 The board is similar to the previous Freedom boards: it has an ARM Cortex-M0+ (MKE02Z64VQH2). The thing which easily gets missed: it has a Kinetis E microcontroller on it. The cool thing is that the CPU can run with 5V supply/logic levels (2.7V to 5.5V supply voltage, instead of just up to 3.3V), making it more applicable to noisy environments. This is a big difference from the L and K family which runs with 3.3V levels. According to Freescale this is the first 5V ARM Cortex-M0+ processor. Compared to the other Freedom boards, it runs only up to 20 MHz (instead the 50 MHz of the other Freedom boards), and has 64 KByte FLASH and 4 KByte SRAM. Priced around US$15, it is about the same as the other boards. So this board seems to be a good fit to evaluate motor control solutions. The documentation refers to the APMOTOR56F8000E BDLC motor board. ❓ It is not clear to me if this reference to the APMOTOR56F8000E is a mistake, as I cannot see how the headers are supposed to fit? UPDATE: received from Freesale the confirmation that an adapter board is indeed needed to connect the FRDM-KE02Z to the APMOTOR56F8000E board. While the microprocessor is designed to run at 5V, the one on this board is powered by 3.3V, at least according to the schmatics in the FRDM-KE02Z User’s manual? I would have expected as this CPU is intended to run at 5V, the board would have 5V supply/logic levels too? On the plus side, the board features a thermistor and IrDA transmitter and receiver. The FRDM-KE02Z is yet another Freedom board. The 5V capable CPU makes it interesting for motor control applications or anything in a noisy environment. However, that board is using 3.3V instead with 5V is a surprise. I only can guess that the engineers did not want to change the other parts of the board, as e.g. the accelerometer is using 3.3V? I hope that this is just error in the documentation or schematics. A true 5V board would have enabled it to use it with 5V Arduino shields, or to use it with any other 5V peripherals. I will see more, once I get my hands on that board. This entry was posted in Embedded, FRDM-KE02Z, Kinetis, Thoughts and tagged FRDM-KE02Z, freedom board, Thoughts by Erich Styger. Bookmark the permalink. How do i create a new project with this board (KE02Z)? Thank you for your attention since now. Program an MCU that will blink the red LED when ‘red’ is being inputted in the terminal, blinking the green LED when ‘green’ is being inputted and lastly blinking the blue LED when the word ‘blue’ is inputted. How do I do this? Have a look at my examples on github which use the Shell component. It offers a command line interface so you can enter ‘red’, ‘green’ and ‘blue’ if you want.